Born: 25 October 1885 in New York City, New York, USA. Died: 22 November 1959 in New York City, New York, USA (aged 74). 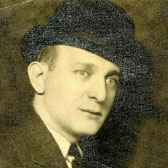 Lewis began his music career by singing in cafes throughout New York City, and began writing songs in 1912. He wrote numerous songs, and collaborated with other song writers, most frequently with Joe Young (3), but also with Harry Warren (2), J. Fred Coots, Victor Young, Peter de Rose, and Harry Akst, among others. Some the most known songs he (co-)wrote include: "For All We Know", "Dinah", "Gloomy Sunday", and "Just Friends".